We have three new polls from Stategic Vision, four from Rasmussen, and one from Quinnipiac University today. None of them change very much. The Strategic Vision polls give Kerry a 5% lead in Michigan, down from the 7% lead Zogby gave him two days ago and a 1% lead in Wisconsin, down from the 2% lead Zogby gave him two days ago. Thus Kerry actually has a small lead in Michigan and Wisconsin is a tossup. Strategic Vision also puts Bush 11% ahead in Georgia, a state no one will campaign in and Bush will win handily. Rasmussen released four more tracking polls taken from July 1 through July 30. 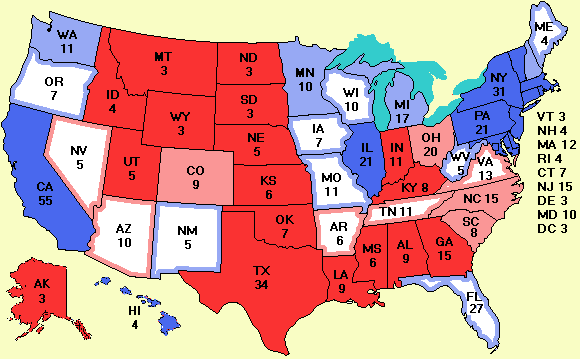 Except for Illinois, we won't use these because more recent three-day polls are available. For the record, here are Rasmussen's results. The Quinnipiac University poll puts Kerry solidly ahead in New Jersey, even with a large (6%) Nader vote.